Summer in Seoul brings a number of the world's top rock bands to the Korean peninsula for the Pentaport Rock Festival in Incheon. The festival is usually held at the end of July and is scheduled to coincide with Japan's Fuji Rock Festival. 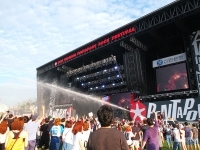 Visitors to Korea are able to enjoy many of the bands and artists scheduled to play at the more expensive Japanese festival for half the price. The Pentaport Rock Festival is held over three days, camping facilities are available and concert goers are advised to pack raincoats and gumboots.